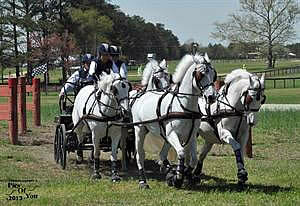 Raeford, NC – The Southern Pines CDE came to a conclusion on Sunday at the picturesque Carolina Horse Park as three pony drivers were crowned 2013 National Champions. In the USEF National Combined Driving Single Pony Championship Tracey Morgan had the trip of day to claim the Single Pony Title for the first time. Jennifer Matheson claimed her third USEF National Combined Driving Pair Pony Championship, with a solid cones phase. The USEF National Combined Driving Pony Team Championship went to Lisa Stroud for the ninth time as she executed a near faultless trip. Morgan (Beallsville, MD) drove her own Fuego 88 flawlessly in the cones phase to post the only double clear in any of the Advanced divisions. The 12-year-old German Riding Pony completed on a three-day total of 130.59. Morgan is a former USEF National Combined Driving Pair Pony Championship but this is the first time topping the Single Pony Championship. Earning the Reserve Championship was the leader following the marathon, Paul Maye (Fairfield, VA) on a final score of 134.71. Maye drove Harmony Sport Horses’ Markus just a little too conservatively to incur 8.32 time faults but leave all the balls in place in the cones. Matheson (Aiken, SC) drove the combination of Bax and Cees to a cones score of 8.90 after incurring six faults for two balls down and 2.90 time faults. The 2010 and 2011 National Champion earned her third title on a score of 145.15. The Southern Pines CDE proved to be a large step forward for Matheson and her ponies after a less than ideal spring campaign. Finishing in second and earning Reserve Champion honors was Wendy O’Brien (Aiken, SC) on a score of 157.37. The 2012 National Champion incurred four balls down and 4.60 time faults for a cones total of 16.60. Stroud (West Grove, PA) drove with great precision to complete the weekend with a cones score of 4.24, one ball down and 1.24 time faults. She earned her record-tying eighth consecutive National Championship on a score of 170.11. “It’s kind of cool,” said Stroud of her ninth National Title (2004 and 2006-2013). Stroud was very pleased with her team on Sunday as they performed so well over the challenging cones course. Heather Schneider (Palm City, FL) earned the Reserve Championship on a three-day total of 201.98, after scoring 14.74 on the cones (one ball down and 11.74 time faults). To learn more about the Southern Pines CDE, visit: http://southernpinescdedotcom.wordpress.com/. Follow the 2013 U.S. Driving Team here. Raeford, NC – The marathon phase proved extremely influential at the Southern Pines CDE as the leaderboards across the competition saw great shake-ups. In the USEF National Combined Driving Single Pony Championship, Paul Maye drove a consistent and determined second phase to seize the two-day lead on a score of 126.39. While in the USEF National Combined Driving Pair Pony Championship, Jennifer Matheson will head into the cones as the leader with a score of 136.25. Lisa Stroud maintained her dressage lead in the USEF National Combined Driving Pony Team Championship and stands on a total of 165.87. All three current leaders were the marathon winners in their respective divisions. Maye (Fairfield, VA) drove like a man on a mission over the eight hazard course guiding Harmony Sport Horses’ Markus to a marathon score of 77.96. The 2012 National Championships won hazards one, four and seven to hold a four point lead going into the cones phase. Lying second heading into the cones are Tracey Morgan (Beallsville, MD) and Fuego 88 with a two-day total of 130.59. Matheson (Aiken, SC) posted the quickest times in five of the hazards on Saturday. 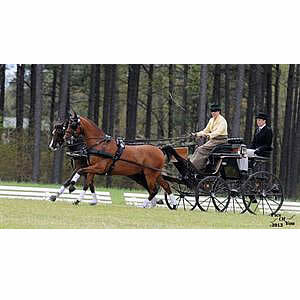 On the marathon the 2010 and 2011 National Champion drove Bax and Cees together for the first time with great success as she posted a score of 86.86 for the phase. Wendy O’Brien (Aiken, SC) the 2012 National Championship and Friday’s dressage leader currently lies second on a score of 140.77. Stroud (West Grove, PA) won the dressage phase of the USEF National Combined Driving Pony Team Championship on a score of 50.24 and lengthened her lead with a strong marathon phase. The reigning National Champion won five hazards (one, three, four, five and six) to earn a marathon score of 115.63. Stroud heads into the cones phase with a nearly 22 point lead as she vies to earn her 10th National Title. Sitting in second place overnight is Heather Schneider (Palm City, FL) with a score of 187.24. Competition concludes for all divisions with the final cones phase on Sunday. For Orders of Go and Results, visit: http://drivingnews.us/results/results2013/SouthernPines/. Raeford, NC – The first day of competition at the Southern Pines CDE came to a close with pony drivers taking their first steps towards earning National Titles as they performed their dressage tests. National Championship competitors were fortunate to enjoy sunny skies, as CDE competitors following the lunch break were met with a deluge of rain. In the USEF National Combined Driving Single Pony Championship Suzy Stafford leads the field after scoring 45.23 in the first phase. Wendy O’Brien heads into Saturday’s marathon with a six point lead after scoring 43.31 in the USEF National Combined Driving Pair Pony Championship. The USEF National Combined Driving Pony Team Championship was the final division of the day and saw Lisa Stroud jump out to the first day lead on a score of 50.24. Stafford (Wilmington, DE) and Wendy O’Brien’s TTE Tea Time drove as the final competitors in the division and set the tone from the very start of the test. The Individual Silver medalist from the 2011 FEI World Driving Championships for Combined Ponies utilized her years of experience to produce a consistent and precise effort with the nine-year-old Morgan gelding. Lying second are the 2012 USEF National Combined Driving Single Pony Champions, Paul Maye (Fairfield, VA) and Harmony Sport Horses’ Markus. The 12-year-old German Sport Pony stallion earned a score of 48.43. O’Brien (Aiken, SC) drove her own Braakmoor Clowny Clark (a 15-year-old Welsh gelding) and Braakmoor Conan (a 14-year-old Welsh gelding) in the first phase as she looks to retain her National Title from 2012. The pair of ponies demonstrated powerful and expressive gaits but a few bobbles cost them valuable marks. Heading to the marathon in second place is Jennifer Matheson on a score of 49.39. 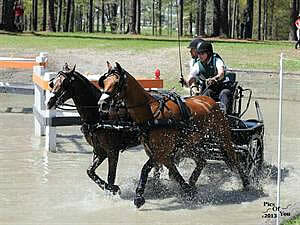 Matheson (Aiken, SC) drove Katrina Becker’s Bax and Danyloo in the first phase. 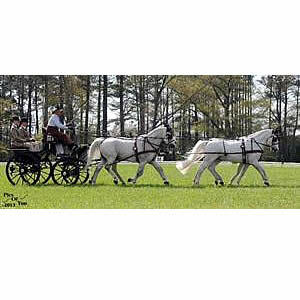 In the dressage, Stroud (West Grove, PA) drove her own Sir Patrick (a 14-year-old Connemara gelding), With Flair (a 14-year-old Welsh gelding), Kilkerin Edward (a 16-year-old Welsh gelding) and Mystic (a 13-year-old New Forest Pony gelding). The nine-time National Champion had a consistent test, highlighted by relaxed walk work. She will head out onto the marathon with a six-point lead. In second place in the USEF National Combined Driving Pony Team Championship is Heather Schneider (Palm City, FL) who drove her own Rambo, Patrick, Cloud 9 and Jazz to a score of 56.64. Competition continues for all divisions with the marathon on Saturday. Lexington, KY – U.S. pony drivers head to Raeford, North Carolina this weekend to vie for National Titles at the Southern Pines CDE. Bragging rights will be up for grabs in the USEF National Combined Driving Single Pony Championship, USEF National Combined Driving Pair Pony Championship and USEF National Combined Driving Pony Team Championship at the annual event held April 12-14. A vastly experienced field of five competitors line-up in the USEF National Combined Driving Single Pony Championship, including previous National Champions and World Championship medal winners. Suzy Stafford (Wilmington, DE) heads to Southern Pines on strong form in 2013. The three-time National Champion (2004, 2008, 2009) and the Individual Silver medalist from the 2011 FEI World Driving Championships for Combined Ponies most recently claimed victory three weeks ago at Live Oak International. Paul Maye (Fairfield, VA) finished second behind Stafford at Live Oak but will look to finish at the head of the field and retain his 2012 National Title. Completing the field are three of the most experienced drivers in the United States; Miranda Cadwell, Bill Long and Tracey Morgan. Cadwell, the Individual Gold medalist from the 2007 World Pony Pairs Driving Championships, does not have to travel far from her base in Southern Pines, North Carolina and will look to add a National Title to her resume in front of hometown fans. 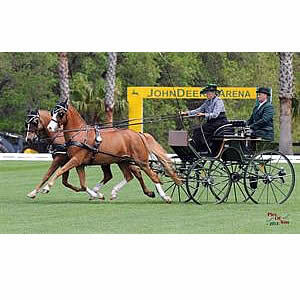 Long (Southern Pines, NC), another local favorite, will use the experience gained driving at seven World Championships to try and add another National Championship (he has won the Four-in-Hand title seven times) to his name. Morgan (Beallsville, MD) also has years from practice driving at the highest level, including sweeping the Pair Pony title from 2003-2009. 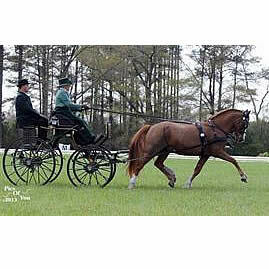 A small but mighty field will vie for a National Title in the USEF National Combined Driving Pair Pony Championship. Wendy O’Brien (Aiken, SC) heads north to Southern Pines looking to repeat as National Champion after having claimed the title in 2012. O’Brien has been training diligently over the past months and saw her efforts rewarded at Live Oak where she broke the 40 mark for the first time on her way to winning the division. Jennifer Matheson (Aiken, SC) who earned the National Championship crown in 2010 and 2011 will drive as a woman on a mission this weekend. Matheson stood on the podium in Lipica, Slovenia alongside Cadwell and O’Brien as the U.S. clinched Team Bronze at the 2011 FEI World Driving Championships for Combined Ponies. Meghan Benge (Windsor, SC) has been making a name for herself over the past few years as a proficient driver in the pair pony division. In 2013, she has placed third in the Intermediate section at Live Oak and won the Preliminary at Little Everglades. 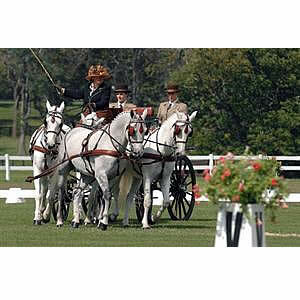 The USEF National Combined Driving Pony Team Championship also boasts a field of three. 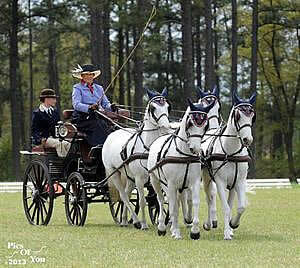 Lisa Stroud (West Grove, PA) aims to claim her ninth National Title in the division driving her trademark team of white ponies. Stroud is also no stranger to success on the world stage having represented the U.S. five times in World Championship competition, including winning Team Bronze in 2007 and 2011. As the 2012 Reserve National Champion in this division, Katie Whaley (Paris, KY) will look to go one better in 2013. Whaley is known for her proficiency in the marathon and cones phases and will aim to drive clear, quick trips this weekend. Rounding out the division is Heather Schneider (Palm City, FL), who has been performing consistently on the Florida circuit in 2013. Competition gets underway for all divisions with the dressage on Friday.